A friend on social media recently sent me a private message saying he had trouble with a storage media card. He asked which brands and types I use, and if I ever had any trouble with them. I told him without hesitation that I very rarely have storage media problems, and if I do, it always shows up in a step everyone should do every time they insert a card into a camera: formatting your storage media card. Formatting is accomplished in as many different ways as there are cameras, but the concept is simple: format your card every time you insert it into your camera. The idea is simple. Have the computer inside the camera “reset” the card, creating what computerists call a file allocation table (FAT) exactly the way the camera needs it. The camera creates the data (folders, tables, markers, etc.) that meets its needs, and marks your card as empty. It also checks for any errors (“bad sectors”) on the card, and if there is a problem, it will let you know then, before it’s time to shoot. Your card then behaves as if it was brand new. This also has a very significant benefit of forcing the photographer to establish the workflow of saving their files to a computer instead of storing them in-camera, since formatting a card will erase all the images on it. I’ve known many photographers over the years who can’t find their photos because they are buried among thousands of other photos somewhere on their cards in their cameras. I’ve also known many students and fellow photographers who are ready to shoot except the instant they trip the shutter, they see the “Card Full” massage. But errant technology management isn’t new or at all uncommon. I find a surprising number of students have their cameras set to medium or small file size. I’m not even sure why – their cameras don’t arrive that way, and they haven’t changed much else. Maybe someone told them they could cram more photos onto their cards that way, which is true, but sadly, they have changed one of the few menu items in their cameras that can completely destroy their images. Put simply, when you change the size of the image in your camera, you are telling it to throw away pixels, pixels you bought. Never, ever change the file size in your camera. If you shoot JPEG files, you will see this dialog somewhere in the menu system of your camera. 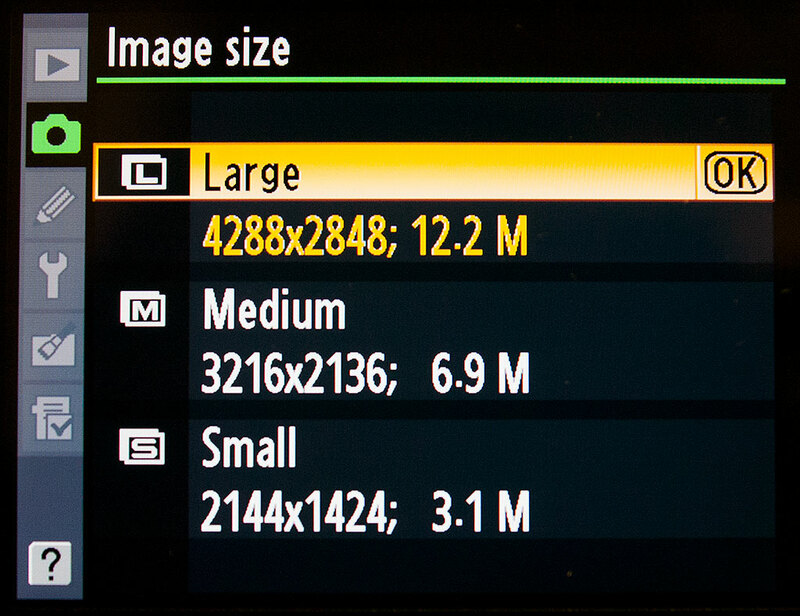 Leave it set to “Large” or “Maximum.” When you shoot RAW files, which I recommend, this menu item is disabled, and the camera gives you all the available pixels.